Allen Forkner, whom many of you know from previous Gun Blogger Rendezvous', put on a pedometer to see haw many miles he actually walked at the SHOT show. I understand Allen was there all day, every day, but still, over sixty miles is pretty impressive. They only list three of four hotel/casinos as being within walking distance of the Sands Convention Center, which is connected to the Palazzo and the Venetian hotels. Not too far from those two is Harrah's, and then a short walk from Harrah's is the LINQ, where I stayed, which used to be called the Imperial Palace, and then The Quad, before getting its latest name. The easiest way to get from the LINQ to the Convention Center is to walk out the front of the LINQ to the Las Vegas Strip, then turn right and walk a fair ways to the front of the Palazzio and the Venetian. Then you have to walk the full depth of the two hotels to get to the very back where it convention center is located. Even following that longest route, it was very easy to get turned around and get lost! Those are BIG buildings!! However, there are shortcuts, if you can figure them out and remember all the tricks. These pictures cover the first part of the short cut to the show. You can walk out one side exit of the LINQ and take this covered breezeway to a side door into Harrah's. You then take a right down a short hallway to the elevators that take you down to Harrah's parking garage level. You walk past the Harrah's bus arrival and departure depot, and then through their parking garage. When you get to the side of Harrah's parking garage, you can then cross the street tothe Venetian/Palazzo parking garage. Once into the parking garage, you follow the cross walk deep into the garage. Fortunately, at least for the SHOT Show, they have some signs along the way that help quite a bit, but getting lost was still an option often exercised. Back in the parking garage you take an elevator up into the Venetian/Palazzo. (It's hard to tell where one ends and the other begins, so I refer to them together. Once you get out of the elevator, the walk starts getting spectacular! You did the hard work so we don't have to!! 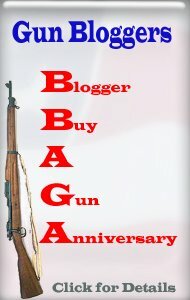 Gun Blogger Rendezvous --- R.I.P. ??? Enough of the Global Warming Already!